It was a delight to spend time with cheesemaker Debra Amrein-Boyes (above) and her daughter, Amanda Vanderlinde, the next generation in cheesemaking at The Farm House Natural Cheeses in Aggasiz, B.C. Hanging out with Chef Chris Whittaker of forage restaurant at The Listel in Vancouver. From Milner Valley Cheese to UBC Farm to a final fine meal at forage in Vancouver’s Listel Hotel. A day without tasting cheese while attending to cheese-festival business in Chilliwack. Visiting The Farm House Natural Cheeses in Agassiz. Delicious sausage-and-cheddar roll starts the final segment of the tour, back toward Vancouver from Thompson Okanagan Tourism Region. Only afterward did we realize this was a day without cheese, but the Bouillabaisse and Cassoulet were more than adequate substitutes. At Gort’s Gouda Cheese Farm, we buy still more cheese. At Shuswap Chefs, we dine as if in heaven. 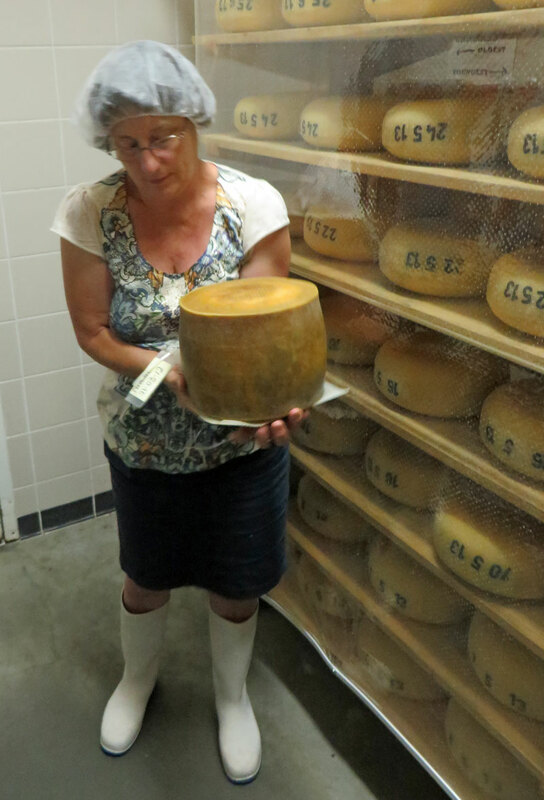 From goat walks to Village Cheese in Armstrong to industrial parmesan, the tour continues. We start and end each day with cheese—and the cooler is full of cheese, too! On the Naramata Bench overlooking sparkling Okanagan Lake, they make cheese and wine under one roof. Following Anita Stewart and Chef Mark Filatow to Waterfront Wines. Eating our way from Apex Mountain to Kelowna—and loving it! Total lack of hospitality at one Okanagan winery leads to a memorable meal at Poplar Grove Winery. From Chilliwack to Apex Mountain above Penticton. Really fine dining at Bravo Restaurant & Lounge in Chilliwack. Cheesing it up at Prestons in the Coast Chilliwack Hotel with Allison Colthorp of Tourism Chilliwack and the hotel’s Dominique Roy. Fabulous lunch at Golden Ears Cheesecrafters in Maple Ridge. We play tourist and pick up our cheesemobile, a 2013 Buick Verano. What a street food day in Vancouver! Quebec cheese en route, Pacific halibut on arrival, the adventure begins. A 2013 Buick Verano Turbo serves as Official Cheesemobile for our B.C. Cheese Tour. Francis has his Popemobile, CheeseLover.ca has its Cheesemobile. It’s a luxurious Buick Verano Turbo to whisk us around British Columbia over the next three weeks. The mission is to see how much artisan and farmstead cheese we can enjoy—reporting on our tasting adventures here and on Facebook and Twitter. As much as we look forward to sampling cheese new to our palates (and generally unavailable in Ontario), we especially look forward to getting to know the men and women who make the cheese. At our first stop, at Golden Ears Cheesecrafters, we’ll be getting into the make room to help make cheese curds. Click here for Google Map showing all 25 artisan cheese producers in B.C. Much thanks to General Motors Canada for providing the Buick Verano for our B.C. Cheese Tour.